The RELEASE is an interactive, insightful symposium of workshops that uses the arts to enhance and support the social and emotional well being of wombmen (not to exclude individuals who self identify) by tapping into various creative and artistic expressions. 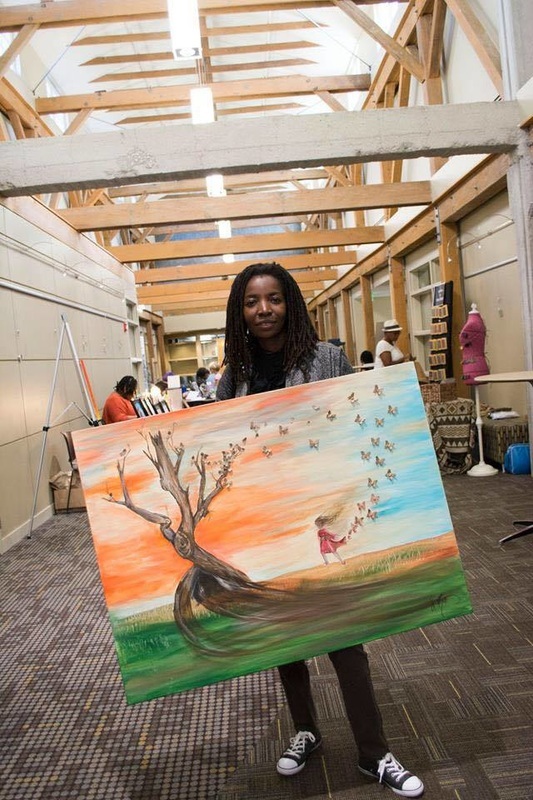 Immerse yourself in hands on activities that will allow you to use your imagination and get your creative juices flowing while connecting and bonding with other artists, creatives,healers, educators, mothers, daughters, professionals, passion seekers and beautiful women in the community who, just like you, will let go and RELEASE! ​Vision Boards n Brunch= RELEASE! Want information on the release? Want to conduct a workshop? Volunteer? Make a donation? Be a sponsor? On May 17th I purchased my ticket to The Release, Giving Thanks, and at the time I didn’t know what to expect, but I had crossed paths with the Event’s core organizer, Felicia Webster. Every time I had been around her, she radiated so much positivity and strength. But I must say that I had been struggling with overcoming some severe spiritual setbacks. The obstacles were blurring my outlook and my future’s vision. So, with my ticket in hand I rode the bus down to Metro Community’s Fort Omaha Campus on May 22nd, and took the first steps onto reclaiming my life. This was the second Annual spiritual gathering of The Release was comprised of a series of Healing workshops ranging from a writing seminar on recognizing the symptoms of grief conducted by Michelle Troxclair, to a head-wrapping class wonderfully led by Celeste Butler, and the list of emotional empowering sessions goes on and on. And the space was filled with soulful music, affirmations, and truly positive vibes. I’ve stated that The Release, Giving Thanks occurred on May 22nd, my birthday or as I like to now call my Re-birthday. A breakthrough occurred on this day, during these sessions, and this realization stayed with me as I journeyed home. I knew I had to shed the past that had weighed me down for far too long. I took all that I had learned and struck up the courage to reach out and contact Felicia Webster for spiritual guidance, and guess what happened? I wanted to reclaim my life! I wanted to walk in my own light. I embraced my past, forgave my past, and moved beyond said past. Now, I still have a climb to go but I’m not afraid to continue paving my life with the bricks and mortar of self acceptance and appreciation. I look forward to attending the next Release event. I look forward to my life finally. All the spectrums of it for I have released -Give thanks!